Robert Ambrose Cole was a self-taught artist who lived and worked in Mparntwe (Alice Springs). Cole's style of painting was influenced by his years growing up in an urban centre, exposed to the art movements of the Central and Western Deserts. He experimented with both acrylic dot painting and the European-influenced landscapes of the Hermannsburg watercolourists, whose proponents included Albert Namatjira and Otto Pareroultja. While Cole maintained both forms of practice, their synthesis led to his shimmering white dot paintings, in which figures and shapes emerge. These works combine a translucency and subtlety, influenced by the watercolours, with Cole's obvious stylistic affinity with dot painting. Cole often emulated natural ochres with acrylic colours. In 'Untitled', 313.1993, through careful placement and very subtle variations in the size of the dots, he builds up a pattern of square forms that appear within the field. This work's intensity is similar to op art, as the viewer tries to define the grid-like shapes that emerge and retreat into the oscillating white field painted over an ochre-brown background. The tracks of lines of dots that create the grid give an almost maplike appearance to the work as the eye charts a path across its surface. At the same time, the painting remains resolutely abstract and is not connected to a particular story and place. 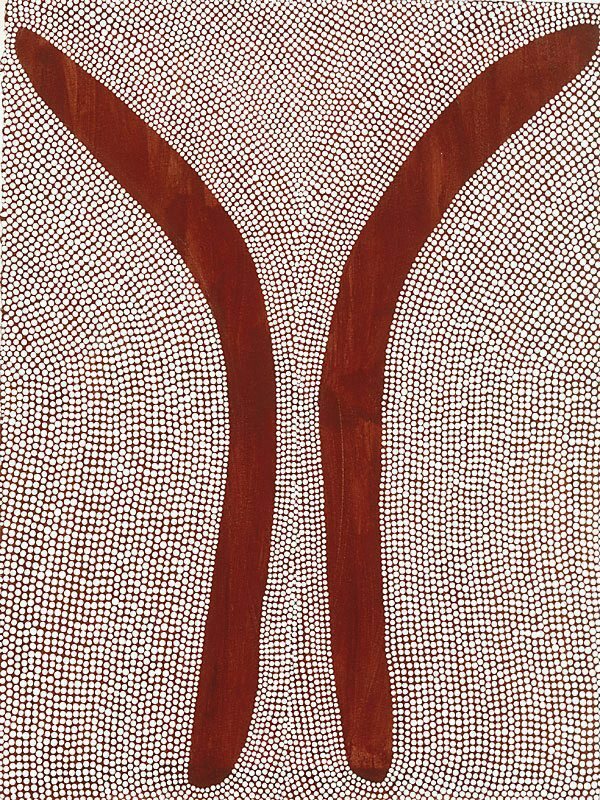 In 'Untitled', 312.1993, Cote painted dots in lines that curve across the paper, defining two forms from the ochre background. These two shapes have been described in many ways: as deriving from ceremonial body markings; as suggesting the dramatic gorges that cut through rock formations in the desert near Mparntwe; or as recalling the shapes of hunting boomerangs. While these may all be possible sources or references in this work, the brown shapes are also abstract, grounded in both traditional Aboriginal culture and a very contemporary painterly experimentation with colour and form.